Making sure your business or community has the right irrigation system in place should mean you’re saving money while maintaining a healthy lawn all year long. Like all systems, an irrigation system needs to be maintained in order for it to function correctly; our landscape designers are experts in the installation and maintenance of commercial irrigation systems. 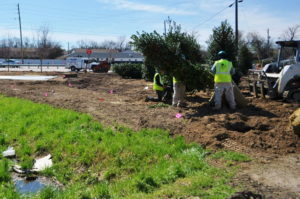 In order to protect the costly investment of planted trees and shrubs, it is important that they are routinely trimmed back and pruned in order for them to grow and bloom in full health. A community or business prides itself on being a place devoid of bugs and pests; Dalzell Designs can make sure your public space stays that way with regular pest control. But moles and mice are not the only enemies to a healthy landscape; weeds can take down a beautiful garden bed if not regularly cleared out. We will keep your commercial space free of weeds through mowing, tilling, soil solarization (this is an environmentally friendly way of getting rid of unwanted fungi), and pulling. One of the best ways to highlight your community’s common area or your business’ entrance is to add some seasonal color; Dalzell Designs can work with your public space to plant annuals like alyssum, zinnia, and marigolds for the warmer months. When the weather turns colder, we can come out and place some winter jasmine, pansies, and sweet peas to ensure your public property is always looking its best. 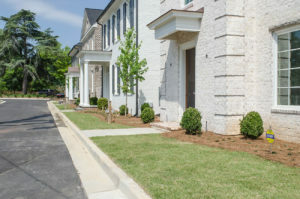 Take a look at some of our Augusta, GA landscape architecture work and client recommendations, and let us know what we can do to meet your maintenance needs. We’re very blessed as a company to be able to grow and expand our landscape design services in the Augusta, GA area over the past seven years. The city of Augusta is our company’s home, but also the long-term home of many of our landscaping crew members. We love the city of Augusta and are very lucky to be able to serve our friends and neighbors with their landscape maintenance needs on a daily basis. From the calm elegance of the Riverwalk, to the buzz of the Masters at Augusta National, this city has our heart. If you reside in the greater Augusta area and need help with landscape maintenance, call the team that cares about serving their community. We’re eager to show you our dedication to landscape design and to our city’s natural eco-system with our ground breaking sustainable approach to landscaping. Reach out today to start discussing your landscape maintenance plan. Get in Touch with Our Landscape Maintenance Specialists Today!